One of the most coveted locations urban explorers hope to get the chance to visit is the mythical City Hall Subway Station. New York City’s very first subway stop, though now abandoned, has gone down the annals of city lore due to its fabled architecture and status as one of the world’s most beautiful subway stations. Despite the fact that it has been over 70 years since the station officially shuttered in 1945, many still await their chance to step inside to take in its stunning Guastavino tilework, elegant chandeliers and leaded skylights. As we previously mentioned: the station is accessible, but only barely so: the New York Transit Museum hosts occasional tours there, but you have to be a member and tickets are distributed on a first come, first serve basis. (As you can imagine, they sell out fast.) If you haven’t had a chance to visit yet, make sure to join us on our Underground Tour of the NYC Subway, which will start at City Hall Park and explore the history of the subway station from its beginning. You will also catch a glimpse of the inside of City Hall Station from inside the 6 train. One of the most obvious is the station’s entrance, surrounded by fencing that looks almost like the entrance to a modern station. It’s located on the edge of the restricted parking lot in front of City Hall. As our tour guide Justin Rivers tells us: “The street entrance to City Hall Station is an old IRT entrance now painted completely black. It’s located inside the gated grounds of City Hall by the Broadway gate directly across from the newsstand on Broadway by the W, R City Hall stop.” According to subwaynut.com, the entrance once had normal, modern green subway globes installed around it, which have since been removed. Today, there’s just a small box with a red emergency light (barely noticeable in the first photo below). 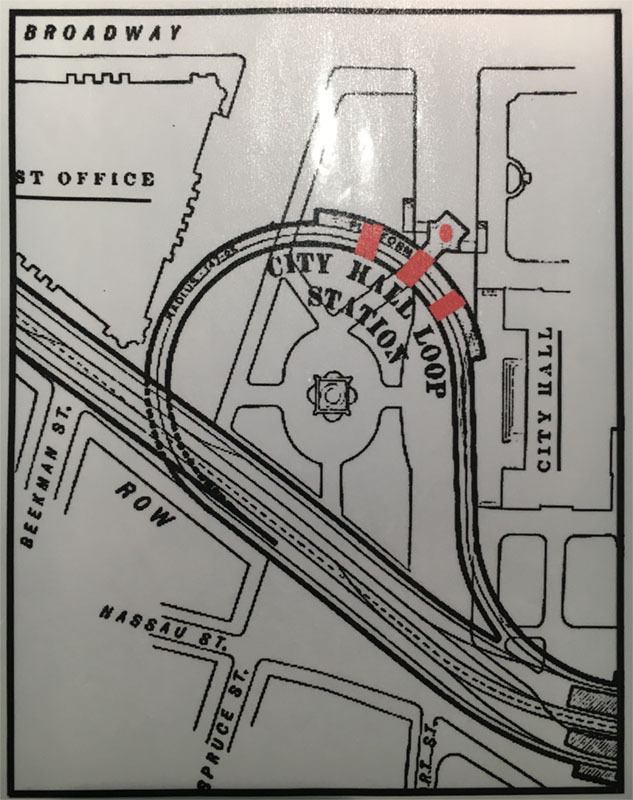 To give you a clearer idea of the approximate location of everything, the following map from the New York Transit Museum archives shows where the three embankments and the mezzanine skylight are in relation to each other, indicated by the three red rectangles and the red dot, respectively. Aside from the more obvious remnants, one thing that has continuously caught our attention is the newsstand outside on Broadway, which Rivers tells us used to be City Hall station’s newsstand, designed by Heins and LaFarge. “…[T]he only thing I could never find out if it’s original or a recreation,” he says. Next, check out the Top 10 Secrets of the NYC Subway and read about the history of the Great White Fleet of Subway Cars.